How many records are there in the Archives? 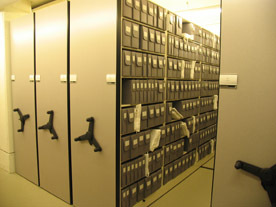 The Archives holds approximately 3,500 square feet of textual records (roughly 7,500 boxes of documents). In addition, we also hold more than 1.5 million pages on microfilm. How far would they extend if placed end to end? If you placed each document from those 7,500 boxes end to end they would extend all the way from Toronto to Quebec City and back to Ottawa. Or, if you started in Calgary you would make it to Vancouver before running out! [This is based on an average of 10 files per box with an average of 50 pages per file. 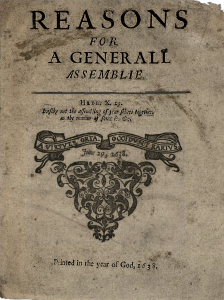 This gives a total of 3.75 million pages. If each page is on average 21.5 x 28cm (ie. 8.5 x 11 inches) this equals 105 million centimetres or 1,050 kilometres!]. How many photographs are in the Archives? We have approximately 15,000 photographs catalogued, scanned and entered into a searchable database within our office (sorry, it is not available via the Internet!). We also estimate another 5,000-10,000 exist in our backlog waiting to be catalogued and scanned. 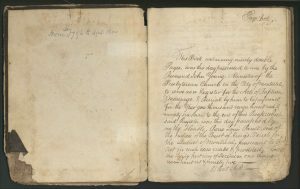 What is the oldest Presbyterian Church building in Canada? 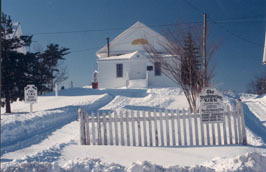 The Kirk in St. George, New Brunswick, which was built in 1790. 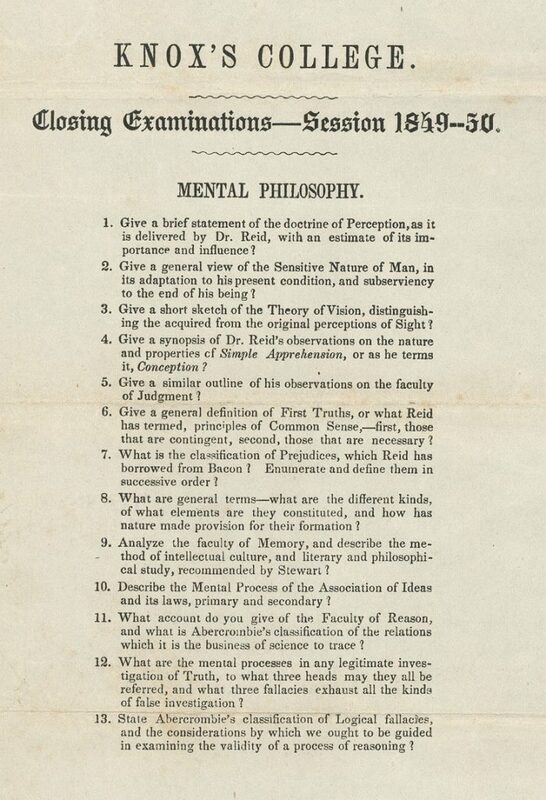 This Mental Philosophy examination was given at the closing of the 1849/50 session at Knox College, Toronto. 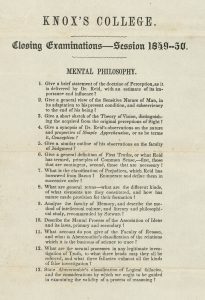 It is the earliest example of a theological examination in the Archives (Knox College Collection, File #202/0001). 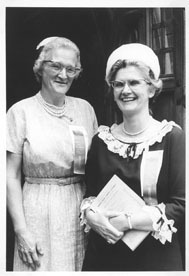 Mrs. Forrester of Cardinal, Ontario and Miss Whale, Director of Overseas Missions for the WMS, were the first women commissioners to attend a General Assembly. This was at the 93rd General Assembly, held at Knox Presbyterian Church, Ottawa in 1967. Mrs. Forrester was a commissioner from the Presbytery of Brockville, and Miss Whale from the Presbytery of Brampton. What does The Presbyterian Church in Canada and organized hockey have in common? They both have their origins at the Victoria Skating Rink in Montreal in 1875! 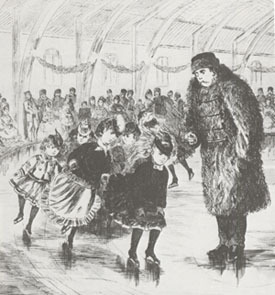 On March 3, 1875 the first recorded organized indoor hockey game was played at the Victoria Skating Rink. The modern game of hockey is often dated to this day. 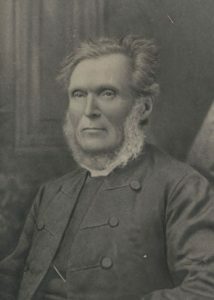 Just over 3 months later, on June 15, 1875 members from the four separate Presbyterian churches in Canada met within the Victoria Skating Rink to consummate the union of their churches and celebrate the formation of “The Presbyterian Church in Canada”. 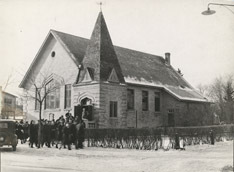 The first sederunt of that first General Assembly was held at the Rink, while the remaining sederunts were held within Erskine Church, Montreal.